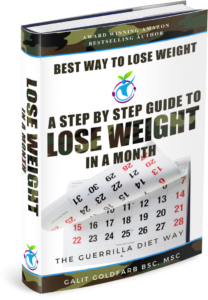 Lose Weight In a Month the Guerrilla Diet Way holds the recipe for success to your health and weight loss attempts. Following the nutritional guidelines of the Guerrilla Diet - The healthiest diet for human consumption, along with supplement recommendations that help you to lose weight and fulfil your body’s nutritional needs, and a simple to adhere to exercise program, it is the best way to change your lifestyle habits for the best and achieve natural, in tune with nature optimal health and weight loss. This book also comes with a FREE recipe book to help you easily cook up the right meals to support your health and weight loss..
Are you afraid you will never succeed at losing your excess weight and achieving optimal health and energy? If your answer is “YES” then don’t lose hope. This program holds the secret to losing weight in a month the right way as well as achieving your health goals. The Best Way To Lose Weight - A Step By Step Guide To Lose Weight In a Month, The Guerrilla Diet Way, takes the knowledge from The Guerrilla Diet & Lifestyle Program and gives you the precise plans to lose weight in a month, including recommended food supplements, exercise recommendations and recipes. This title from the Guerrilla Diet Health Series provides you with a practical step-by-step ‘how to’ approach to lose weight in a month and put you on the path towards achieving permanent good health and easy weight loss. If you apply the simple steps revealed in this program, you will have mastered the path to lasting optimal health and weight loss. My Book: 50 Best Recipes For Health And Weight Loss The Guerrilla Diet Way, Free! To get started with Your Step By Step Guide To Lose Weight In a Month - The Guerrilla Diet Way right now, simply follow the link below.